Grenada, a stunningly beautiful island tucked away in the Eastern Caribbean, is the world's second largest producer of nutmeg. The nutmeg tree, Myristica Fragrans, is truly remarkable in that it produces a fruit, the pericarp of which contains two distinct spices, nutmeg and mace. The tree is a majestic, densely foliaged evergreen, with spreading branches, dark brown bark, and small, pale yellow bell-shaped flowers. It grows to a height of 40 to 50 feet and thrives at elevations of 1,500 to 2,500 feet in the rich volcanic soil found in the sheltered valleys of Grenada. The pericarp or fleshy fruit is lemon yellow to light brown in colour. When ripe, it splits open, exposing the brilliant scarlet, web-like membrane or avril known as the mace, which encircles a dark brown brittle shell. Inside the shell is a single glossy brown, oily seed — the nutmeg. In Grenada, the pericarp is known as the nutmeg pod and is used to manufacture Morne Délice nutmeg jam, jelly, and syrup. The pod was once a waste product of the nutmeg industry; however, since it is now utilised in the manufacture of de La Grenade nutmeg products, the nutmeg tree has assumed greater economic importance to Grenada. Nutmeg and mace are similar in aroma and taste but the mace is more refined and delicate. Its fragrance is mellow, warm, and highly aromatic. Culinary uses of the nutmeg include both sweet and savoury dishes. Grated nutmeg is added to beef, mutton, pork, and lamb dishes and it is used extensively in desserts and cocktails. It adds a spicy flavour to such vegetable dishes as cabbage, cauliflower, spinach, and mashed potatoes. In Grenada, it is widely used in meat stews, vegetable sauces, egg dishes, fruit salads, and pie fillings and is sprinkled liberally in rum punch and punch-à-crème. The use of nutmeg in traditional folk medicine is well documented. In India, Hindu physicians once used nutmeg to cure headaches, fever, bad breath, and intestinal disorders. In Arabian medical writings, nutmeg was touted as an aphrodisiac and a remedy for kidney and stomach ailments. Nutmeg oil, which is extracted from the fixed fat, is used in Grenada to relieve the pain associated with arthritis. 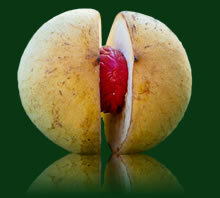 Commercially, nutmegs are utilised in the manufacture of perfumes, soaps and shampoos. A large portion of Grenada's nutmegs is used in the meat packing industry of Scandinavia to flavour various types of sausages. Nutmeg is also an ingredient in inhalants and liniments which are used to relieve congestion caused by influenza and colds.